Influence Play (aka, influence strategy, social play, play) def., n. A social or rhetorical technique, irreducibly unique, employed by a person, organization or surrogate to improve mutual or competitive advantage through methods and means of persuasion. Twenty-three plays constitute the Taxonomy of Influence Strategies, a complete classification of the most basic strategies observed communications, marketing, media, military and government intelligence, politics and sales among other influence industries. You can learn more on our Playmaker Influence System page or by reading the System 3 white paper. So give me an example of a play or, as you call it, an influence strategy? Read any news article. Look at any ad. A company is doing a big product launch – that’s called a Peacock. A politician is bending his opponent’s prose – that’s a Recast. A network is mimicking a rival’s reality program – it’s a Crowd. How did you find these plays? The first influence play to be documented, the Call Out, was observed at a technology conference in Paris in 1995 when a client of Alan Kelly’s communications firm, Oracle CEO Larry Ellison, used it against Microsoft CEO Bill Gates. In that moment, Alan realized that the moves and maneuvers of influence could be thought of as irreducibly unique — like chemical elements and biological species — which sparked his quest to identify, describe and classify them. This culminated in the 2006 publication of The Elements of Influence with white paper updates in 2012 and 2018. How does a play make it into the influence table? UNIQUE Embodies a single principle of influence (i.e., cannot be described by two or more plays or variables). STRATEGIC Describes an approach, method, motive or plan (e.g., selective communication as found in Filter). CAUSAL Effects outtakes and outcomes (e.g., perceptions, opinions); is not a result. INTANGIBLE Exhibits predominantly abstract properties (i.e., no physical makeup or movement). 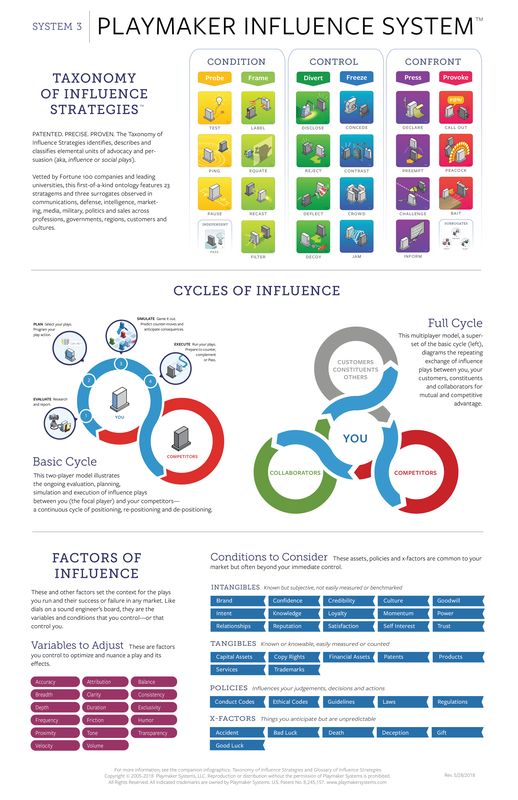 Learn more about the ins-and-outs of influence strategy in our System 3 white paper. What’s the Playmaker system? What’s in it? 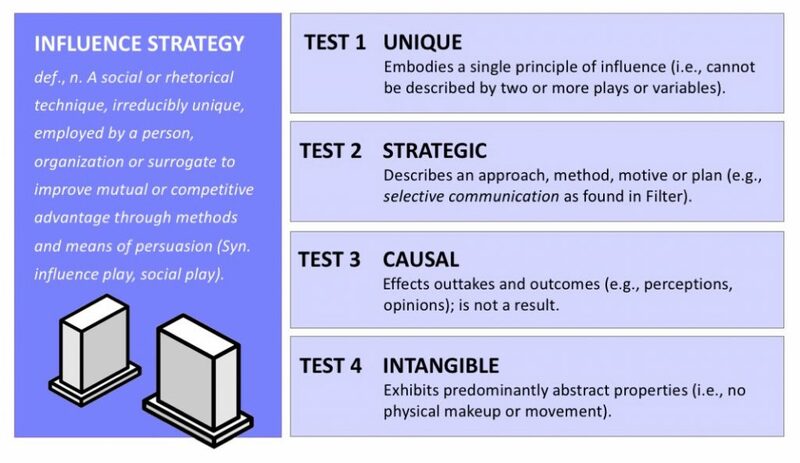 The Playmaker Influence System is a patented three-part decision system for analysts, strategists and students of communications, marketing, media, military and government intelligence, politics and sales. Acclaimed by business and academic leaders, it gives influencers the ability to pinpoint and manage the strategies of their marketplace with unprecedented clarity and efficiency. There’s nothing like it in the world. Chemists have the periodic table of elements. Linguists have transformational grammar. Accountants have GAAPs. Musicians have the melodic scale. Influencers have had nothing, until now. Why do I need something like that? Because without a system and standard, you’re practicing your craft as a form of alchemy. With one, you’re practicing with precision. The Taxonomy of Influence Strategies allows professionals to know more exactly and more quickly the plays of their marketplace, how they work, and how they can be used to sustain competitive advantage–whether or not the advantage they seek is mutual, collaborative or exclusive. For more, read our Vision page. By publishing this system, aren’t you publishing the secret code? And if everyone has it, won’t the result be gridlock? Aren’t you taking the fun out of marketing (or sales, PR, advertising, lobbying, etc.)? Doesn’t your system stifle creativity? Our experience suggests that the Playmaker model enhances, not squelches, creativity. While it might seem to turn something that’s cool into something that’s clinical, it also helps focus influencers on the matter at hand. Take the example of a creative brainstorm — fun stuff . With our system, you know more surely what it is that you are brainstorming. If there are, after all, 23 unique plays in the human practice of influence, then it’s better to know which ones are relevant. But aren’t you giving away trade secrets? It’s how you use the plays that makes the difference. And if you think of your work as a kind of public service, then consider, too, your duty to open your toolbox. Accountants tell us how they account. Musicians tell us how they make music. Chemists tell us what comprises their compounds. In this era of eroded trust and fake news the moves and motives of influencers are too important to be kept secret from influencees. But if you publish the secret code, aren’t you putting the professionals who practice influence at risk? Aren’t you costing them their livelihoods? Not the good ones. Like every maturing practice or discipline, the best practitioners look constantly for ways to be better, more efficient and competitively advantaged. For savvy influencers, this system offers powerful insight into the gamesmanship of rivals and the preferences of collaborators. It’s a recipe for winning. It’s a codecracker to success. Smart users will put the system to work. Standard Guidance is a rich resource of +1,000 expert tips and best practices for running plays and winning. It’s the global characteristics and probable outcomes of each play and surrogate. You can learn more here. The system is just too complicated. You’re smarter than you know. And the system is simpler than you think. Look for a play that rings a bell — like the Filter or Ping — and you’ll realize that what you do today is already in the Playmaker taxonomy; it’s merely describing what you do and, for your benefit, it’s putting it into a framework and lexicon you can use with others. Chemists have 119 elements. Yours has 23. Can more than one play be identified in a single situation? Yes. Watch a debate, for instance, and you’ll see both a Contrast and Call Out at work. Both are designed to expose another player. 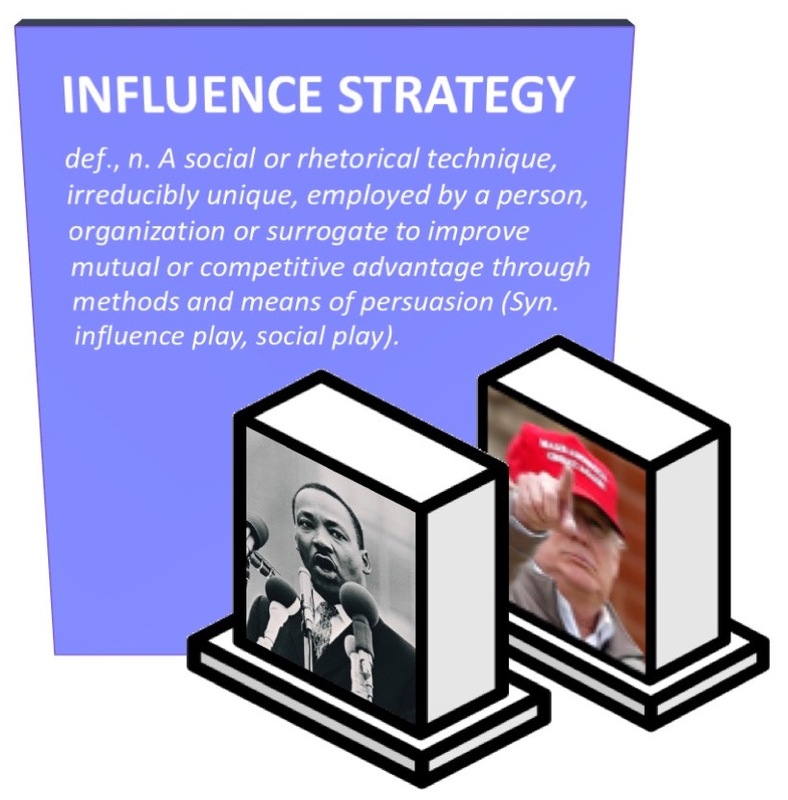 Influence strategies (i.e., plays) are rooted in social science, so there are overlaps. And because context is always key, it’s easy for one play to be seen, say as a Mirror in one context and a Call Out in another. The downside, of course, is that it’s possible to read two or three plays into a single situation. The upside is that it’s two or three fully described strategies, not 23. Some of these plays seem unethical. This system’s not for me. The Playmaker taxonomy describes what is, not necessarily what should be. 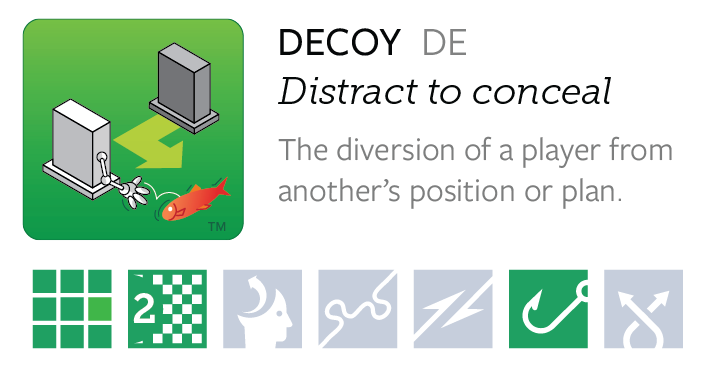 While the Decoy, Jam and Bait, as examples, smack of foul play, these are plays that exist in every marketplace. While we don’t encourage the application of unethical strategies — or to educate users to that end — their existence can’t and shouldn’t be swept under the rug. By describing them richly, in fact, is to expose their existence and uses. Ignore them at your peril. We hope you’ll take a closer look. It’s the product of extensive literature review, expert interviews, market testing with Fortune 100 companies and teaching at major research universities. Influence has existed since Plato. Why no one has seen fit to organize it into a taxonomy, much less an ontology, amazes us. What we’ve done is give a housing to what’s always existed. In fact, for our work we’ve received a U.S. Patent. Think of Playmaker as an archaeologist and its system as a fossil. What you get is the Rosetta Stone of influence. We dusted it off, but we didn’t carve it. Are you trying to turn something into a science that’s not meant to be scientific? These elements of influence seem arbitrary. All of this work falls in the realm of a discipline we call Influence Strategy — the practice of influencemakers, or playmakers, if you will. Further, it is all bounded by the social sciences where hard lines are rare. So, yes, the practice of running plays is not like the practice of mixing chemicals or coding DNA. But there is an urgent opportunity to define boundaries, perhaps that are grey more than black and white, that can be discerned consistently, reliably and as a standard of use across industries, governments and cultures. These plays, as you call them, seem to be for the zero-sum-game types. My approach is purely collaborative. Where’s the trust play? Where’s the reputation play? Those are the plays I run. You may be mistaking your objectives with your strategies. Trust and reputation are what you seek, and our experience suggests that they are constructed with and achieved through influence plays. If your M.O. is to collaborate, to achieve the win-win, we contend you’re running plays that help you do this. Look carefully at the strategies we call Test, Ping, Equate, Recast, Contrast, Crowd and Challenge. These are the plays we often see in the signatures of collaborative influencers, perhaps like you. For a deep dive on this subject, read Alan Kelly’s peer review article, Dancing With the Giant or view his video debate here with communication scholar James Grunig. This is clever, but it’s just not what I do. It is if you’re in communications, finance, marketing, media, military and government intelligence, politics, sales — any profession or practice that involves words, messages, symbols, stances and causes. Whether you’re a strategist, analyst or student of influence, you are running or assessing plays, all the time. As such, you need a standard by which to recognize the true nature of your work and to have a system that helps you manage and measure with precision and speed. Are these plays you’ve described applicable across cultures? What about languages? And age groups? The system and its plays have been scrutinized and taught on five continents and across major industries and multiple professions. 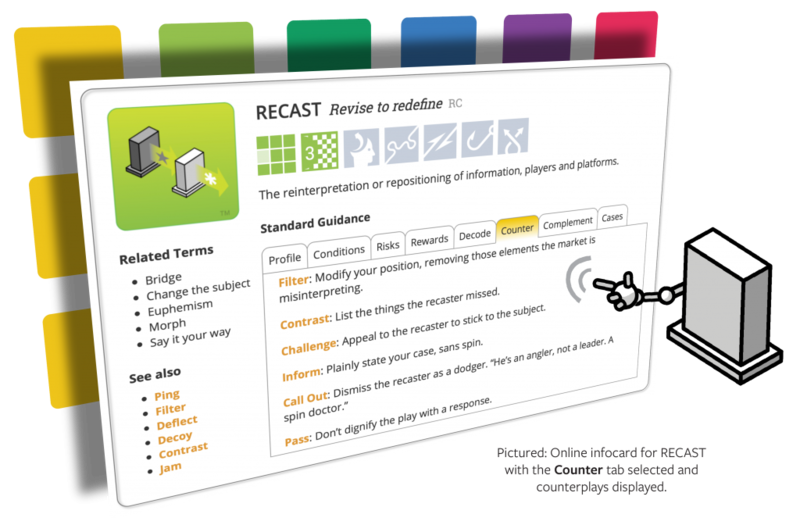 By virtue of where the system was conceived and curated — in Silicon Valley and Washington, D.C., respectively — some of the play names have an American character, but through 12 years of testing in business and academia, we find that the strategies we’ve described are independent of the countries, cultures and people who use them. This is the essence of the power of the Playmaker Influence System; it describes what people do in their efforts to influence, regardless that they may be doing so for competitive or mutual benefit and irrespective of their backgrounds and conditions. How can I get my organization to use Playmaker? How can we use this to get onto the same page? The system can be approached in small steps or large. You can assign Alan Kelly’s landmark book, The Elements of Influence, to read among your team members and discuss over lunch. You can read our Playmaker blogs or on our Facebook page. Follow Playmaker chief Alan Kelly on LinkedIn or Twitter @playmakeralan. And, of course, you can drop us a line. Whether it’s a Playmaker Workshop or a full blown Play Action Map, we have a variety of services and tools to help you get going. How do I explain this to my boss? Walk them through the interactive taxonomy here free iOS Playcaller app. Have in mind a play that they’ve run recently — or that’s been run on them — and show them that in three taps they can know the name of the play and, in one more, what to do about it. They’ll be hooked. 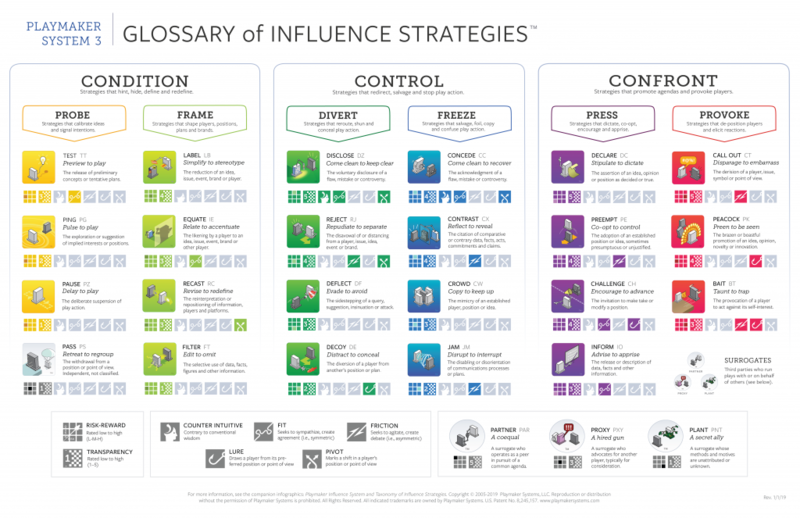 Print them a copy of the Glossary of Influence Strategies and start using the lexicon, if even casually. If they’re a reader, give them a copy of The Elements of Influence. How can Playmaker be used in my organization? 2. As a Best Practice. 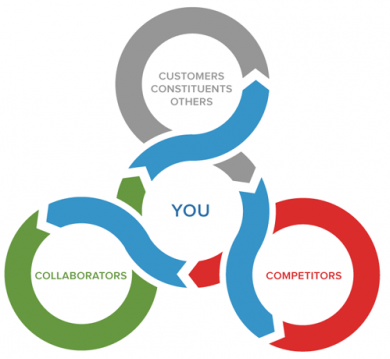 The Playmaker Influence System accelerates understanding and mastery of the games and gamesmanship of marketplaces. Once you adopt it, you won’t ever see things they same way again. Our clients and friends tell us that “thinking in Playmaker” is addictive. 3. As a Toolset. 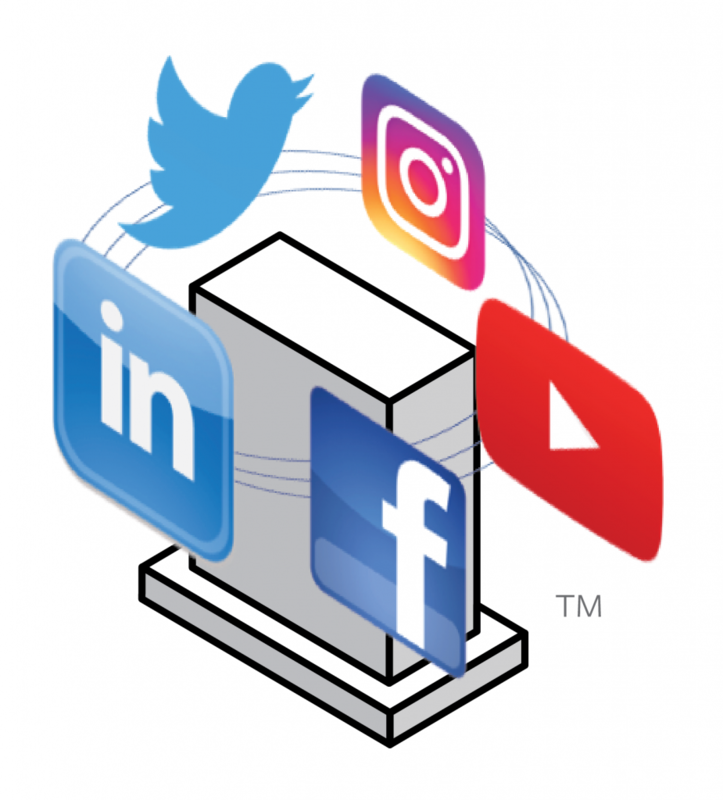 Visit here to learn more about our consulting and speaking, research and measurement, training and simulation, and software and licensing services and software. What do you mean by lingua franca? A lingua franca is a language systematically used to make communication possible between people who do not share a mother tongue. The first known lingua franca was used throughout the Mediterranean basin during Byzantine and Renaissance eras as a language of commerce and diplomacy. It was comprised mostly of Italian with a broad vocabulary drawn from Turkish, French, Greek, Arabic, Portuguese and Spanish. The influence industries need a lingua franca. They are laden with myriad and subjective dialects, appellations and words to describe what they do. The result is low command-and-control, subjective and impressionistic analysis, and a lower regard than more mature fields and disciplines, like finance and accounting, management, law, engineering, and the physical sciences. What they have that influencers don’t are standard terminologies, systems and ontologies that describe their professional units of practice. Can my regional staff be trusted with Playmaker? Will the mere act of deploying the system be a tacit order to pick fights? If you position the system as sword, it shall be swung. If you position the system as a shield, it shall be held up. If you position it as a strategy system, it will be approached with craft and care. It is a system that can be used to educate your team and to help them control markets, not simply defend them. What do you mean by the term play action? Play Action is the phrase we give to describe the moves and countermoves that occur between influencers. Any and every marketplace is awash with the games of playmakers. It’s a competition of contrary and complementary strategies between you, your rivals, allies and independents. Think of Play Action as the movie and plays as the scenes. It’s what you need to know to understand, fully, the nature of your role and how you, your own story, and the characters around you are interacting. See Cycles of Influence for details. The Taxonomy of Influence Strategies, the centerpiece of the Playmaker Influence System, is a classic taxonomy. It’s our way — and yours — to understand how influence strategies are ordered and co-located. It’s the first taxonomy ever to put the amorphous practice of influence into a rational and readable system. A branch of metaphysics concerned with the nature and relations of being. A particular theory about the nature of being or the kinds of things that have existence. We like to think of an ontology as a taxonomy with detail or depth. With meat on the bones, if you will. It’s an idea that’s helped scientists and philosophers better understand how things are. The Playmaker model does just that. As the first influence ontology, it explains in full detail — from the traits, conditions, risks, rewards, counter-plays, case examples and more — the scope and scale of the discipline of influence strategy and the component parts that comprise it. See our Services & Software pages for detailed offerings and descriptions.